Our Handmade Ceramic Pottery is Made in the USA! 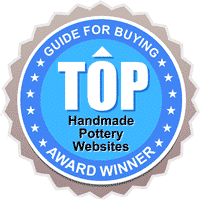 Beautiful ceramic pottery in clean organic designs, created in the Blue Ridge Mountains of Virginia in the American tradition of quality ceramics. Shop here for dinnerware, bakeware, kitchenware and home decor that is safe and lovely to use. With its original log walls, original fireplace, and three double barrel chimneys, the cabin which houses the Emerson Creek Pottery factory outlet offers considerable interest to those wishing to steep themselves in the rich history of the region. And, our guests enjoy the opportunity to connect with the past by experiencing the special quality of our handmade ceramic pottery which continues a true American tradition handed down to us from Colonial times. Shop magical designs for perfect cookies every time. Shop here on our website, and if you're ever in Virginia, please come visit our store housed in the historic Wade House built in 1825. Located in the foothills of the Blue Ridge Mountains of Virginia, Emerson Creek Pottery artisans are continuing the American tradition of handmade ceramic pottery making in a contemporary way.